Several primary types of patellar fractures have been identified, each with separate diagnostic, imaging, and management considerations. The primary types include transverse, vertical, marginal, and osteochondral fractures. Transverse patellar fractures, displaced and nondisplaced, are seen in the images below. Radiograph of a displaced transverse fracture of the patella. 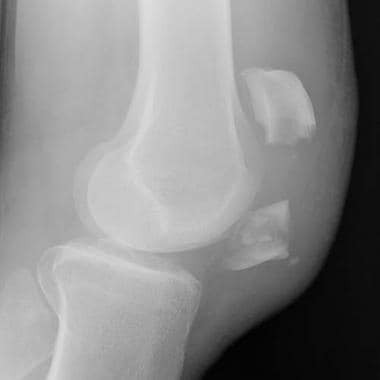 Radiograph of a nondisplaced transverse fracture of the patella. Orthopedic hardware failure may result in malalignment of fractured patellar fragments; in these cases, further surgery may be necessary. Other complications related to hardware placement include sepsis, malunion or nonunion, and femoropatellar degenerative arthritis. A distance of 3 mm or more between fractured patellar fragments should be noted in the radiology report. This degree of separation may lead to an increased incidence of malunion and posttraumatic degenerative arthritis. Recognizing an osteochondral fracture is important, because displacement of a fragment that contains cartilage, subchondral bone, and trabecular bone may occur, resulting in a loose body. 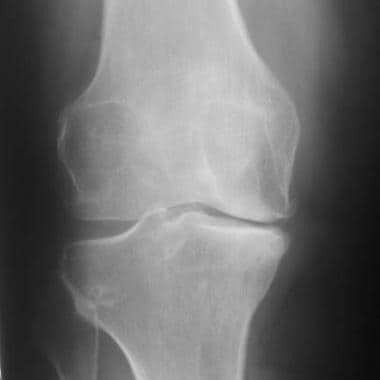 In long-term follow-up studies, degenerative arthritis of the patella has been reported to be more common in knees that were injured previously than in noninjured knees. The arthritis may be due to surface irregularities that involve the fracture fragments, as well as damage to the articular cartilage, resulting in increased contact stresses. CT scanning is useful when a suspected fracture is not visible on radiographs. The expeditious use of CT scanning can prevent a delay in treatment and help to identify the position of fracture fragments and the localization of intra-articular loose bodies. Bone scans are useful when a fracture is suspected yet the radiographic findings are normal. If the bone scan results are also normal, a fracture can be excluded. However, if the findings are positive, the age of the fracture cannot be accurately determined, because bone scanning results can be positive in the setting of fractures for as long as 24 months. MRI also can help to detect abnormalities that are not identified on plain radiographs. Unlike bone scanning, MRI can be performed without delay and does not use radiation; it may also be less expensive. This modality can show bone-marrow and soft-tissue injury in great detail. 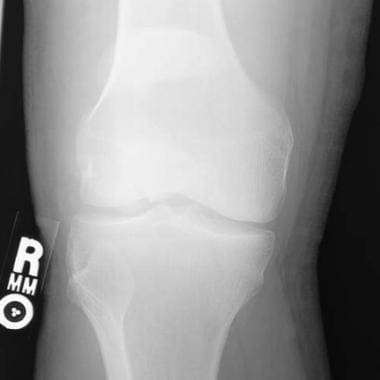 Radiographic examination for the detection of patellar fractures optimally includes anteroposterior (AP), lateral, and tangential or Merchant views. AP radiographs may obscure the findings of patellar fractures. Lateral views can be useful in evaluating the trabecular arrangement of the patella, as well as comminution and separation of fracture fragments. Tangential views are especially helpful in assessing vertical fractures, as well as in distinguishing a fracture from a partitioned patella. Vertical fractures demonstrate a fracture line that courses superiorly to inferiorly, and these fractures can also be displaced. Comminuted fractures demonstrate a stellate pattern of fracture. Osteochondral sleeve fractures are characterized by a small avulsion fragment from the inferior pole of the patella, which is best demonstrated on the lateral view; these findings are usually accompanied by the presence of an effusion and a high-riding patella. Other imaging modalities (eg, MRI) are more useful than radiographs in fully characterizing the cartilaginous injury associated with an osteochondral patellar fracture and can define radiographically occult fractures. Because a sleeve fracture is in the coronal plane of the patella, this injury may be difficult to diagnose based on plain radiographs. The differentiation of an acute fracture from a partitioned patella may be difficult on radiographs. Usually, the features of bipartite patella include a wide radiolucent line that courses across the superolateral margin of the patella, as well as smooth, well-corticated, opposing margins. These features are well depicted in the tangential projection. Because a bipartite patella is often bilateral, views of the opposite knee can be helpful for comparison. A sleeve fracture occurs in the coronal plane of the patella and may be difficult to diagnose on plain radiographs. In patellar fractures, CT scanning is primarily performed for occult or osteochondral injuries. The patient is placed in the supine position with his or her feet externally rotated 15° and pressed against a perpendicular footrest. CT-scan sections are obtained with the knee at rest, with the knee extended and quadriceps contracted, and with the knee in 15° of flexion with a relaxed quadriceps. The position of the fracture fragments can be determined by identifying the fracture line. The reconstructed images in the sagittal, coronal, and axial planes can aid in localization of the fragments. CT scanning is limited in the evaluation of soft-tissue injury, but MRI may be performed to further evaluate this condition. CT scanning may be more useful than MRI in the identification of loose bodies. MRI is advantageous in the assessment of imaging signs related to patellar fracture, including bone bruises, soft-tissue injury, and loose bone fragments. The anatomy of the patellofemoral joint can be assessed in several planes. For example, axial imaging is useful for evaluating patellofemoral joint alignment, retinacular attachments, and overlying patellar cartilage. Sagittal images are useful for evaluating the quadriceps muscles and tendons, and the patellar tendon can be imaged in all 3 planes. Traumatic dislocation of the patella (seen in the image below) may result in patellar fracture, medial retinaculum damage, lateral femoral condyle contusion, and effusion. These injuries can be evaluated with T1-weighted , T2-weighted fast spin-echo (FSE), or short-tau inversion recovery (STIR) images in all 3 planes. 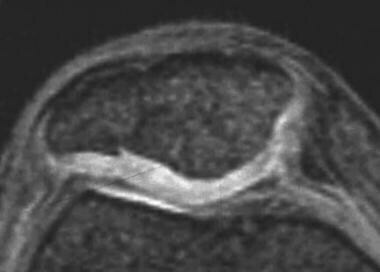 Magnetic resonance image following a patellar dislocation. Avulsions of the medial retinaculum are best imaged with fat-saturated, T2-weighted FSE MRI for detection of bone fragments, edema, and hemorrhage. Edema and hemorrhage appear as areas of increased signal intensity on T2-weighted images; fat-saturated, T2-weighted FSE images; and STIR images. 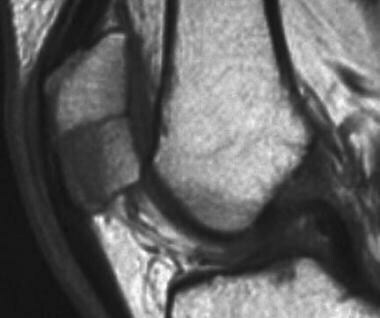 Increased signal intensity in the patella after dislocation can be seen on T2-weighted images. A dorsal defect of the patella, which is a benign defect of the posterior patella covered by articular cartilage, can mimic osteochondral pathology. 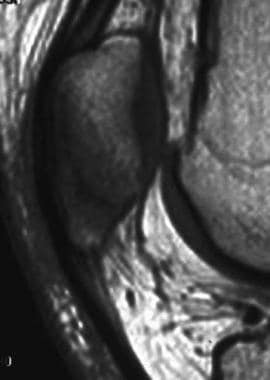 MRI is useful in characterizing this lesion, which has intermediate or low signal intensity on T1-weighted MRIs, sometimes with central regions of increased signal intensity, and is usually a centimeter in diameter, well defined, and located in the superolateral part of the patella. Fractures of the inferior pole of the patella may be associated with tears of the patellar tendon. Patellar tendon tears are characterized by increased signal intensity on T2-weighted; fat-saturated, T2-weighted FSE; and STIR images. The tendon may be retracted or thickened. Patellar fractures may also be associated with damage to the quadriceps tendon and/or extensor musculature. Coronal or sagittal images are helpful in illustrating the longitudinal extent of the muscular injury, whereas axial views are helpful in defining the anatomic relationships among the involved muscle groups. Axial T1-weighted imaging is appropriate for evaluation of muscular atrophy. Increased signal intensity in the quadriceps tendon on images obtained with any sequence is highly associated with the presence of a muscular tear. Sinding-Larsen-Johansson syndrome, which is defined as osteochondrosis of the distal pole of the patella at the tendinous insertion, is of uncertain etiology but is related to chronic traction injury. This condition may mimic a stress fracture of the patella, an osteochondral sleeve fracture, or an un-united ossification center. The injury is characterized by a focal area of decreased signal on T1-weighted images and increased signal intensity on gradient-echo or fat-saturated, T2-weighted FSE images. Occult stress or insufficiency fractures are characterized by the presence of a linear band of low signal intensity on images obtained with all sequences; surrounding edema is also depicted. Occult fractures are seen in the images below. Magnetic resonance image of an occult patellar fracture. Patellar fractures may also be detected in the healed phase on MRI, as seen in the images below. 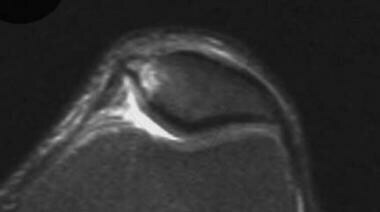 Magnetic resonance image of a healed patellar fracture. The effectiveness of ultrasonography in the setting of patellar fractures is limited. Because of the close association of the articular cartilage posterior to the patella with the femur, an adequate scanning angle that is unimpeded by the overlying bone is not attainable. Therefore, ultrasonography is rarely used in clinical practice. Secondary signs may be present in an acute patellar fracture, and sonograms may demonstrate these well. For example, ultrasonography can be useful in defining an effusion within the suprapatellar bursa, a well-defined fluid-filled space that is superior to the patella and posterior to the quadriceps tendon. The normal, moderate echogenicity of the patellar ligament and quadriceps tendon may be interrupted by focal areas of echogenicity, or they may be discontinuous in a partial tear. Bone scanning is useful for evaluating a stress fracture of the patella, especially when an injury is superimposed on a bipartite patella. Early after an injury to the patella, increased radionucleotide uptake can be present. This finding is indicative of hyperemia and edema. In the acute phase (first 3-4 wk), uptake in the patella is more diffuse. In the subacute phase (2-3 mo), radionucleotide uptake becomes more intense and localized; subsequently, in the healing phase, the uptake gradually decreases. Within 2 years, the results of 90% of bone scan studies return to normal. A normal patellar bone scan that is obtained 1 week after trauma excludes an occult patellar fracture. Consider the use of other imaging modalities (eg, CT scanning, MRI) for suspected injuries, because the resolution and evaluation of soft tissues is limited with bone scanning. Berkes MB, Little MT, Pardee NC, Lazaro LE, Helfet DL, Lorich DG. Defining the lateral and accessory views of the patella: an anatomic and radiographic study with implications for fracture treatment. J Orthop Trauma. 2013 Dec. 27 (12):663-71. [Medline]. Schüttrumpf JP, Behzadi C, Balcarek P, Walde TA, Frosch S, Wachowski MM, et al. Radiologically hyperdense zones of the patella seem to be partial osteonecroses subsequent to fracture treatment. J Knee Surg. 2013 Oct. 26 (5):319-26. [Medline]. Mauch F, Ammann B, Kraus M. [The role of MRI in dislocations of the patella and other knee pathologies]. Unfallchirurg. 2014 Mar. 117 (3):211-20. [Medline]. Dupuis CS, Westra SJ, Makris J, et al. Injuries and conditions of the extensor mechanism of the pediatric knee. Radiographics. 2009 May-Jun. 29(3):877-86. [Medline]. von Engelhardt LV, Raddatz M, Bouillon B, et al. How reliable is MRI in diagnosing cartilaginous lesions in patients with first and recurrent lateral patellar dislocations?. BMC Musculoskelet Disord. 2010 Jul 5. 11:149. [Medline]. [Full Text]. Smith TO, Davies L, Toms AP, et al. The reliability and validity of radiological assessment for patellar instability. A systematic review and meta-analysis. Skeletal Radiol. 2010 May 23. [Medline]. 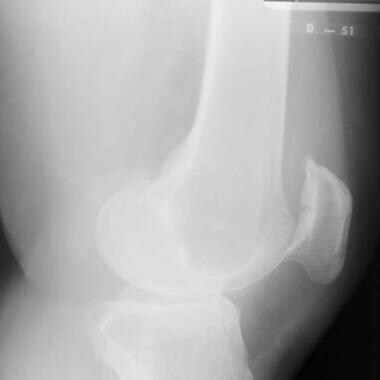 Moretti B, Speciale D, Garofalo R, Moretti L, Patella S, Patella V. Spontaneous bilateral fracture of patella. Geriatr Gerontol Int. 2008 Mar. 8(1):55-8. [Medline]. Lee J, Sagel S, Stanley R, Heiken J, eds. Computed Tomography With MRI Correlation. 3rd ed. Philadelphia, Pa: Lippincott-Raven; 1998. 1402-6. 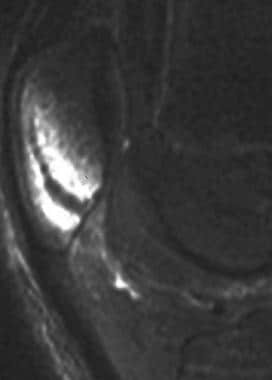 Axial T2-weighted magnetic resonance image of a bipartite patella. 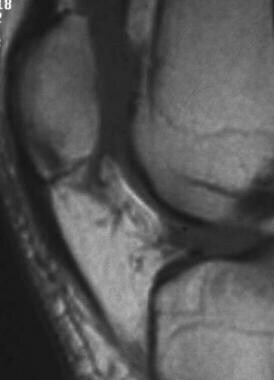 Sagittal T1-weighted magnetic resonance image of a minimally displaced patella fracture. Magnetic resonance image of a "jumper's knee." Radiograph following modified tension band fixation. We wish to thank Dr. Ray F Kilcoyne, MD, for his previous contributions to this article.